This must be the secret to the dressing at my favourite sushi place in Toronto. It's hands-down the best salad dressing I've ever tasted. Your dressing looks just like theirs! Thanks, obachan, I'm going to have to try making variations of this until I find thei "secret recipe"! BTW, your salad looks really really delicious! Funny thing! I actually DID bake a carrot cake today myself (down to the sinful cream cheese frosting!). I'm trying out a vegan recipe cos I have to bake it for a gathering in a fortnight, but somehow I must have done something wrong with the egg substitutes or something, because it turned out doughy at the bottom. Non-vegan carrot cakes that I've baked before turned out fine, so I don't know what's wrong. Any tips, Obachan?? 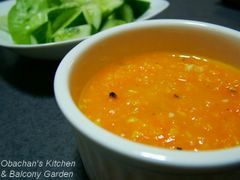 Maybe I should keep my grated carrots in the future to try out this dressing of yours!! It looks so pretty with the green vegetables, and I'm sure it's great tasting too! Yeah, their dressing could be carrot dressing. Try, try, try. And tell me their secret when you find it out. Mmmm… I’m no expert and I have never used egg substitutes before, so I cannot give you a tip or advice. Sorry. 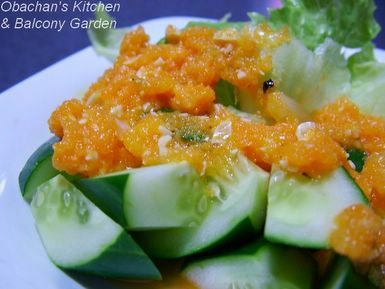 When I googled to pick a carrot dressing recipe, I saw many blogs by Japanese wives saying, “This dressing is my kids’ favorite!” I guess the good balance of the sweetness of the carrot and sourness of the vinegar is the key. 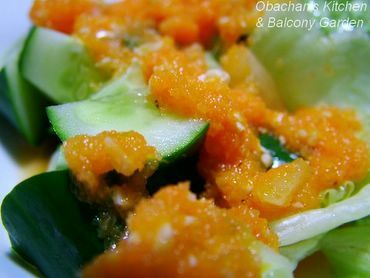 This looks and sounds delicious, Obachan! I'll have to try to make it sometime. grats for passing your Test !